When I talk about something that represents me I have to use hearts. Not only do I collect hearts of all kinds, but I consider myself a woman of great heart. I've been to some mountain tops and through some valleys of darkness in my 62 years and I'm still steppin' and loving life. I used a white textured ATC and some red handmade silk paper from Marco's Papers on this little piece of art. A word to the wise, when attaching silk paper, don't use a tape runner, I used Scor-Tape to attach this piece after a sticky learning experience. Hope you all have a wonderful weekend filled with Love! Supplies: ATC 2 1/2" 3 1/2" Marco's Paper, Papers: Red silk handmade paper-Marco's Paper, SU-Whisper White, Stamps: Hero Arts Design Block-Country Hearts, SU-Tiny Tags, Ink: Ranger Archival Ink-Jet Black, SU-Jewelry Tag punch, Sharpie Paint Pen-gold, Fiskars corner rounder punch, The Paper Studio Spare Parts-gold tiny heart brad, Scor-Tape. Hi Beverly , sweet ATC . Beautiful heart paper and thanks for tip .. Thanks too for sharing on ATC Challenge blog . Gorgeous ATC! Thanks so much for joining in with Quirky Craft's Anything but a card challenge this week. 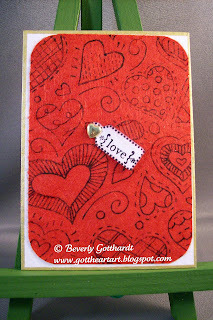 this is very pretty, thank you for joining in with our ATC blog challenge.